Based on the West African tradition of Adinkra cloth stamp symbolism, this work attempts to cast deep multi-cultural roots by combining the idiomatic simplicity of aboriginal tradition with the Western ideal of re-contextualizing parts in unison to obtain a greater sum. Acrylic and Latex on Canvas, 4 x 6.5 feet, 2014. 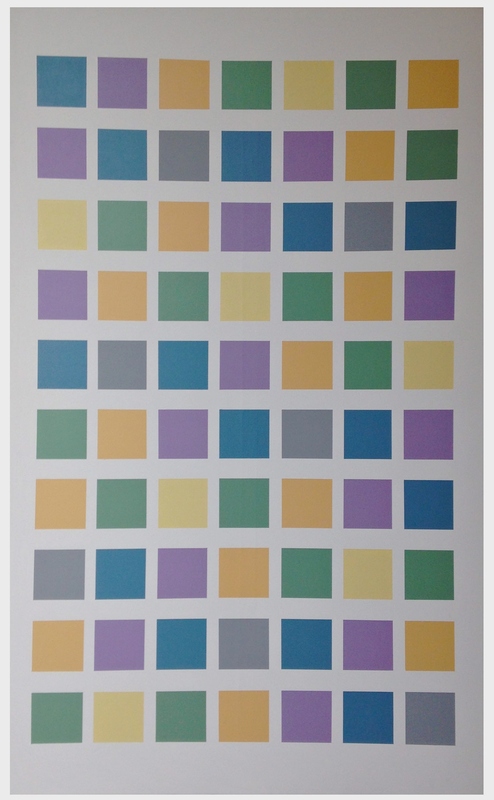 Each color in this work represents one of those numbers, 1, 4, 6, 9, 5, or 0 and writes out the final digits of the first 70 square numbers, reading from left to right.